Latvian girl in national headdress. Allegory of Latvia. On the banknote, issued in 1996, is a diving security strip with the text "5 Ls". In addition, on the banknote, the signature of Einars Repše differs from his signature on banknote of 1992 issue. The oak and stylized oak leaves that are viewed through, superimposed on the motive of decorative suns. 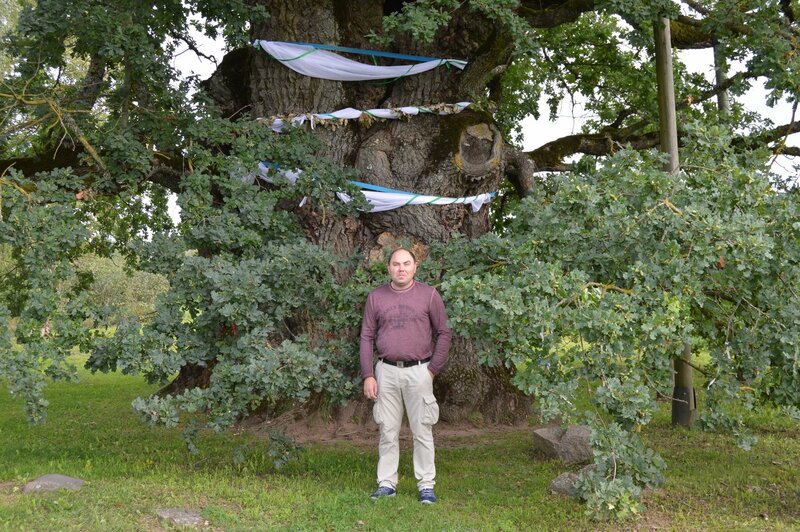 Oak of ancestors in Kaive. 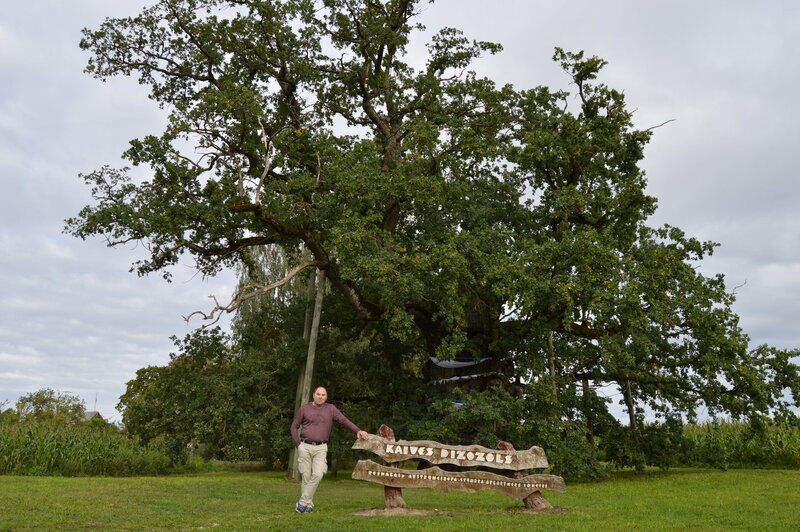 The biggest tree in girth in the Baltics and Eastern Europe. In the 20th years of the 20th century the lightning struck the top of the tree, so only the one largest branch survived. When the oak was in full bloom, the girth of its crown was about 70 m, height - 17 m. Presumably, the ancient oak footstool was a cult place. 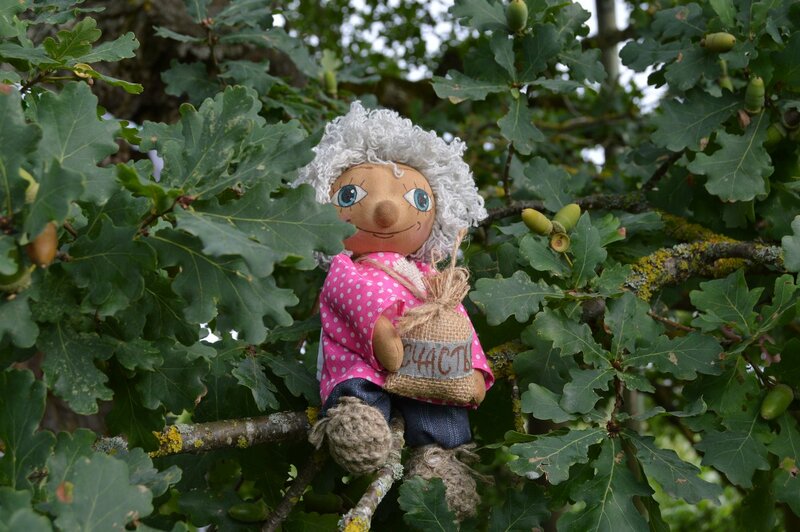 Until recently, nearby residents believed, that before a long journey they should go to the oak, then the trip will have a success. As a place of worship of the ancient Latvians, it is included in the list of archaeological sites. A tree, as secular republican values, is on the list of protected objects of nature. 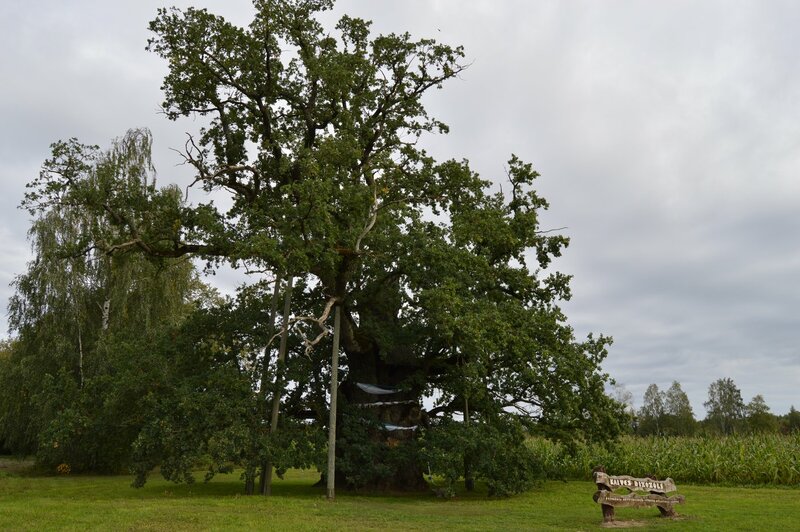 Oak of ancestors Kaive is eleventh in thickness and most voluminous oak in the Baltics and Eastern Europe. Speculation about his real age vary, some believe that it is 800-1000 years old. Today, its girth is 10.2 meters. On right side is Latvian national ornament, taken after Lielvarde Belt. The Lielvārde belt is regarded as an outstanding example of a hand-woven adornment, a two-colored (red, white), patterned combination with the middle or the edges interwoven with a green or, more rarely, blue or purple thread, and with a variable motif (geometric pattern). Historically, its geographic distribution was Jumprava, Kastrāne, Krape, Laubere, Lēdmane, Lielvārde, Madliena, Meņģele, and Rembate parishes. Although traditional belts from elsewhere in the country stand out with their rich ornamentation, only the Lielvārde belt has become the basis for a modern myth of the belt’s very ancient origins, the cosmic code that is written into it, and its special powers of protection. In Latvian contemporary culture, the Lielvārde belt leads its own independent, symbolic existence in people’s consciousness and its motifs are often used in contemporary culture. This independent life began with director Ansis Epners’s documentary "Lielvārdes josta" (The Lielvārde Belt; 1980) whose script was written by Estonian graphic artist Tenu Vint. Comparing the Lielvārde belt ornamentation with other national and cultural patterns, Vint raised the hypothesis that this belt had preserved the information code of an ancient civilization; that the story of the universe was inscribed therein. A German mystic and healer by the name of Dina Ries, encouraged by Latvian Rasma Rozīte, "read" the belt’s ancient information in 1986. The Lielvārde belt was one of the most powerful symbols in the years of Latvian national awakening movement in the late 1980s and has not lost its importance even today. The information that ornamented belts in antiquity were not used only as a personal adornment but also served to protect the wearer is found in a number of traditions, although that does not necessarily mean that the Lielvārde belt must have been a part of, for instance, a priest’s clothing. The scenario for the origins of the Universe read into the belt; the belt as a meditative system; as a yet untested piece of knowledge of the Universe may or may not be true: much will depend on what and how we want to see. One thing is more or less clear, however: it is the Lielvārde belt that possesses a mythical power far beyond that of other belts and it is not because of the technology used in making it or because of its complicated patterns or beautiful colors, but because of its powerful symbolism. The base of ornament consist if traditional squares, which named Māras krusts (The cross of Mara, also the cross of crosses). Denominations in numerals are in bottom left and top right corners. Lower left in words. Decorative sun, carved out of wood and a spinning wheel in the background. Latvian coat of arms is in bottom right corner. The Latvian national Coat of Arms was formed after the proclamation of an independent Republic of Latvia on November 18, 1918, and was officially adopted on June 16, 1921. It was especially created for its independent statehood. The national coat of arms combines symbols of Latvian national statehood, as well as symbols of ancient historical districts. 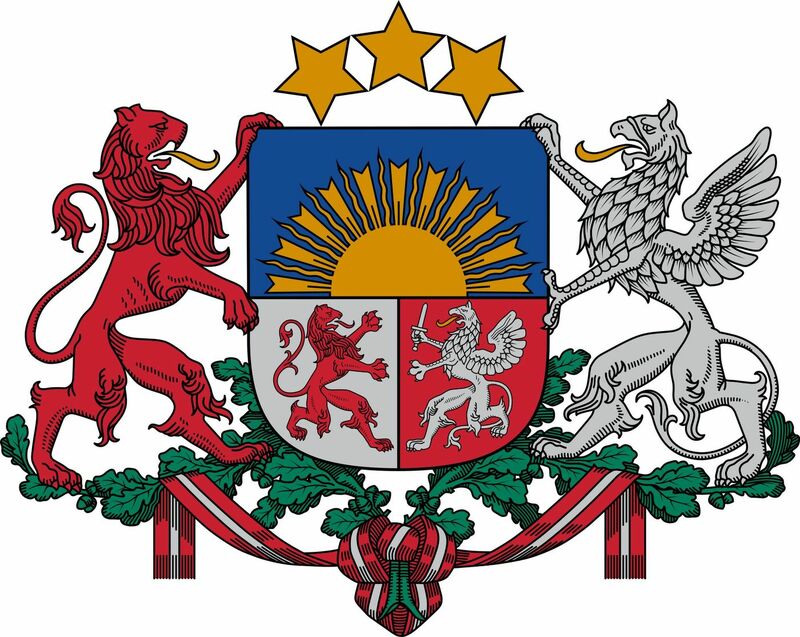 The sun in the upper part of the coat of arms symbolizes Latvian national statehood. A stylized depiction of the sun was used as a symbol of distinction and national identity by the Imperial Russian Army's Latvian Riflemen during World War I. During the war, the sun figure was fashioned with 17 rays that symbolized the 17 Latvian-inhabited districts. The three stars above the coat of arms embody the idea of the inclusion of historical districts (Vidzeme, Latgale and combined Courland-Semigalia (Kurzeme-Zemgale) into the united Latvia. Culturally historical regions are also characterized by older heraldic figures, which already appeared in the 17th century. Courland and Semigalia (Western Latvia) are symbolized by a red lion, which appears as early as 1569 in the coat of arms of the former Duke of Courland and Semigalia. Vidzeme and Latgale (Eastern Latvia) are symbolized by the legendary winged silver creature with an eagle's head, a griffin. 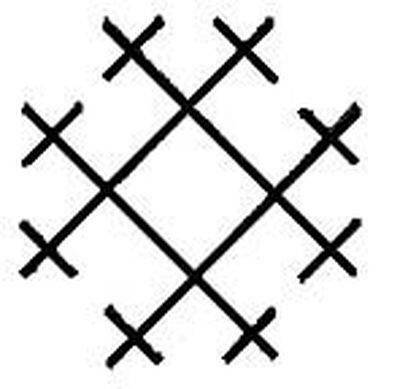 This symbol appeared in 1566, when the territories known today as Vidzeme and Latgale had come under Lithuanian control. Base of the coat of arms is decorated with the branches of an oak tree, Quercus robur, which is one of Latvian national symbols. The Latvian national coat of arms was designed by the Latvian artist Rihards Zariņš. Denominations in numerals are in bottom left corner and on the top, centered. Top left in words. Designers: silkscreen specialist Valdis Ošiņš and architect Imants Žodžiks. 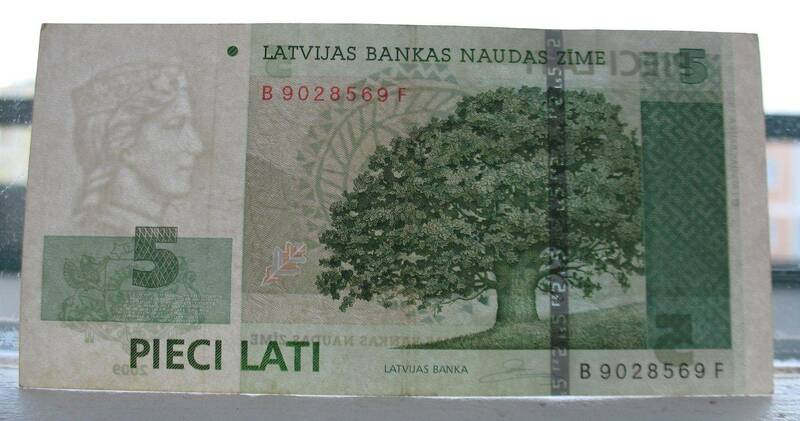 In anticipation of a trip to Latvia, in May 2014, I found an information on the Internet with the assumptions, that this oak, on the banknote 5 Lats is likely located near the village of Kaive. 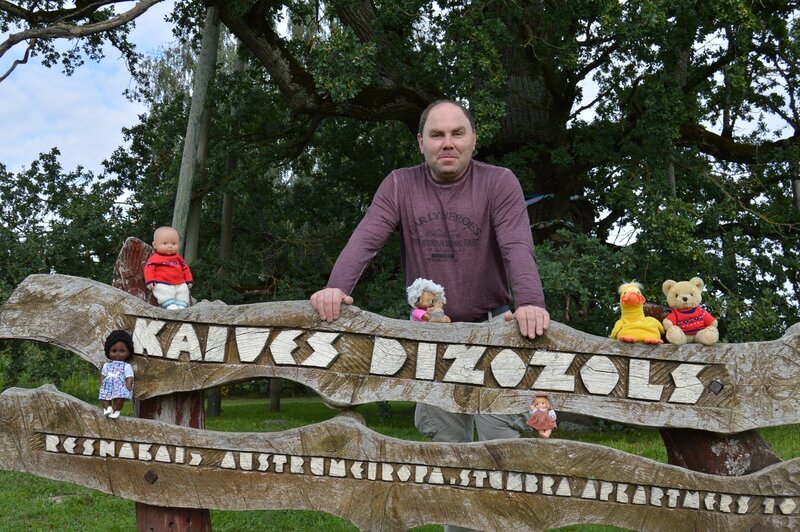 It is on the road to Ventspils, if you drive from Riga, in Tukums region. My wife and I became very interested in visiting this place. After right turn from paved road we faced an unpaved one, sprinkled with coarse gravel. I drove a few hundred yards and decided to make sure that we're going in the right direction. Went into a village library, near the road. Women, and them there were six, were very pleasant and talkative. 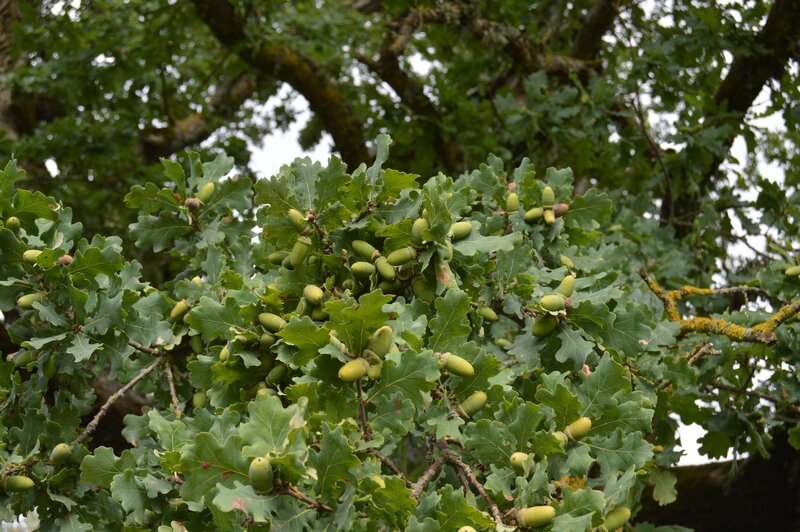 We just became a little upset, because they said, that the oak is barely alive, he is very old and it is good, that we have come now, because, who knows, how many years are left for the oak. Having gone 8 kilometers we reached the goal and were pleasantly surprised. It is evident, of course, that the tree is really old, but in our opinion, still very much alive. 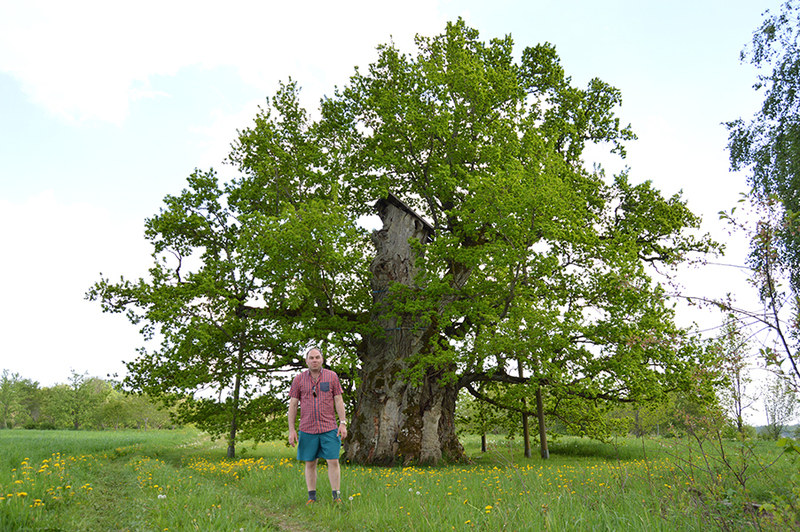 Just try to imagine, what this oak has survived for some, just simply, 1000 years. This photo you can see here.